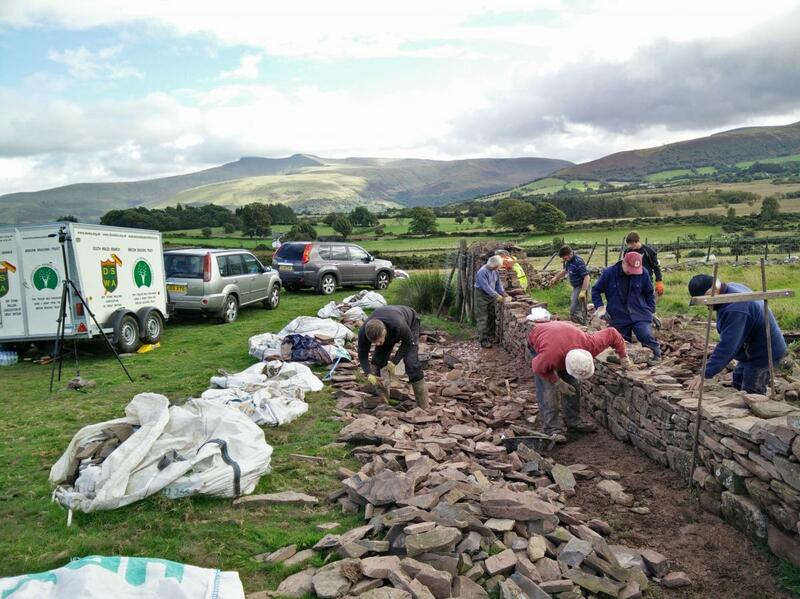 2017 September 9-10th .The DSWA Wales branch returned to the fields of Blaencamlais farm beyond Libanus in the Brecon Beacons National Park. 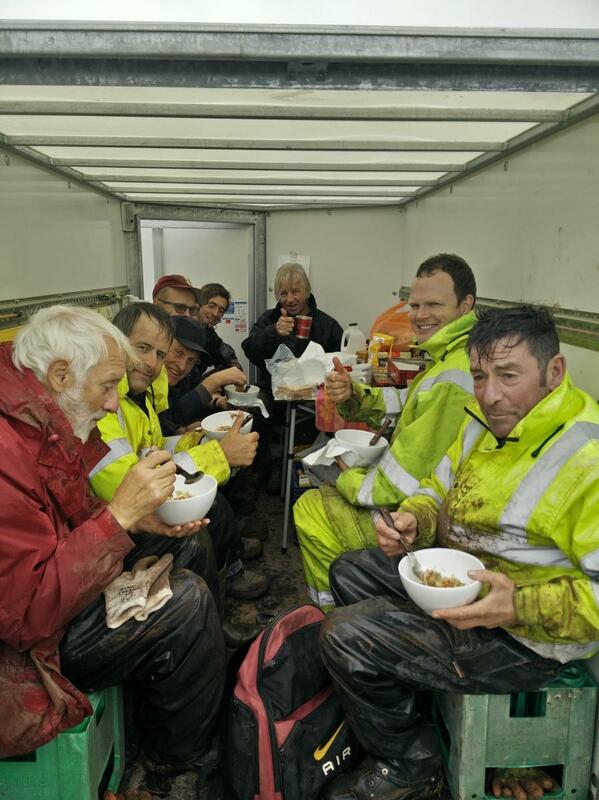 The weather forecast was very ‘Brecon-esk’ and consisted of varying degrees of wetness over the two days. Fine rain, heavy showers, horizontal squalls and the very brief appearance of heulog. The Saturday was attended by a few (now very regular) faces. Ian, Richard K, Simon, Colin and Gareth. 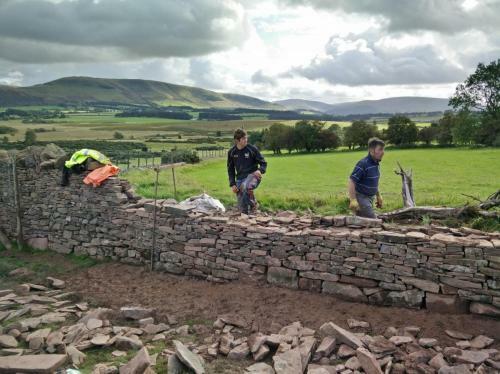 Gang master and branch honorary secretary Brian Lock ensured that the necessary facilities were in place for a decent walling weekend to commence. Due to the nice weather (by Brecon standards) it was decided not to erect the field shelter and make do with the confines of the branch trailer. A quick remodel of the trailer internals fashioned a very comfortable habitation which could house up to eight people from the elements. The weekend was also attended by a newbie called Will from Penmaen, Gower. 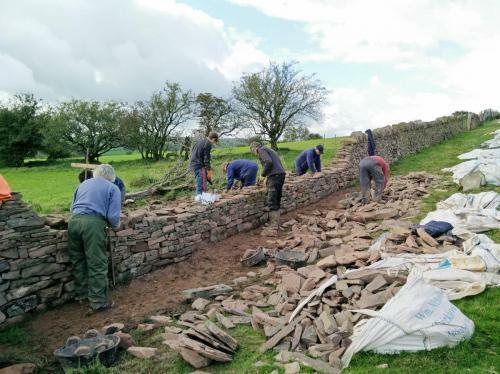 This was Will’s first attempt at ‘walling’ and under the instruction of the gangmaster he was shown the intricacies of building a solid field wall using the ubiquitous Old Red Sandstone. Late afternoon and the team of wallers had lifted an impressive 11m up to the through height, this included having re-laid all footers. A brief appearance was made by the sunshine and members Ceri & Nia who popped by to say hello. 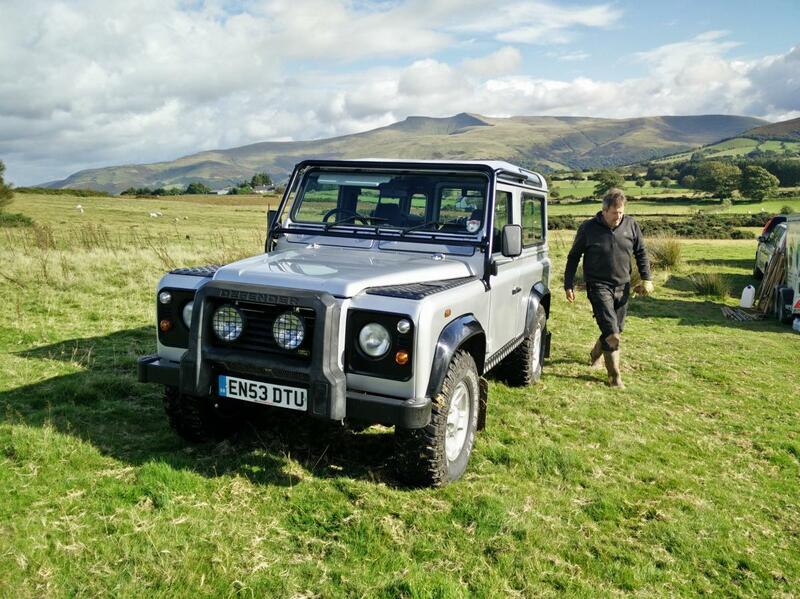 Day one complete all that was left to do was to take an impressive shot of a Defender for the Land Rover magazine special edition “Tips on keeping Land Rovers cleaner than a family car when off road”. Sincere thanks for the photography and a very welcome return to Toby. Good to see you! Sunday brought an additional member to the party (yours truly) and by 08:30 the now team of eight were putting stone on the wall. By late lunch the gangmaster called everyone into trailer for a very welcome hot bowl of cawl. Taken with bread, thanks must be mentioned to Mrs Frazer for taking the effort to make this delicious lunch. It was very well received and reminded branch members that our efforts were appreciated. 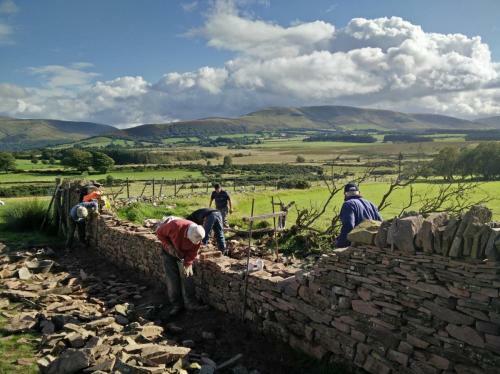 Lashings of tea and beetroot brownies ensured that by 3pm the wall was ready to coped, unfortunately the copes were not in abundance and as such farewell’s were made, course feedback forms completed and invites to join the best Dry Stone Walling Association in Wales passed on. Committee members then met for a brief year end meeting (90 minutes) of which minutes will be circulated soon. A thoroughly successful weekend with a stock proof wall marking the boundary of Mynydd Illtyd common plus we hope to see Penmaen Will back walling again with us soon. The branch will return on the 22nd October 2017 for a clean up day and to cope the wall. All members welcome.